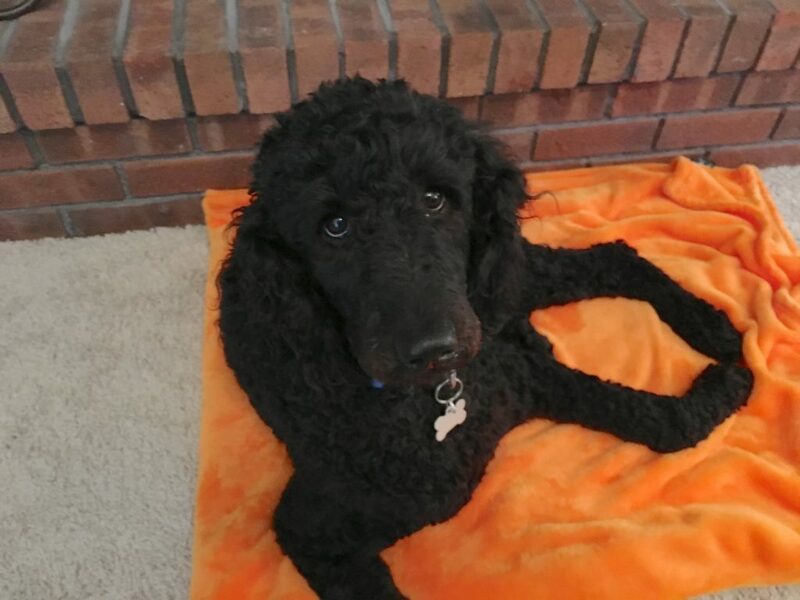 Ruby is a three-year-old Standard Poodle who lives in Omaha. Her guardian’s children bought a dog obedience training session with me to teach her to stop getting over excited at the door, stop jump up, mouthing people, invading people’s space and pulling on the leash. Ruby was much better behaved during the greeting than I was expecting. Normally she jumps up on guests, but the scent of the other dogs I recently worked with was just enough of a distraction to keep her from doing so. When I sat down with the dog and her guardian, Ruby consistently invaded both of our personal spaces and jumped up an down off the couch. After she did this the second time I showed the guardian how to use body language and movement to disagree with this behavior. Ruby’s behavior wasn’t surprising. Each time she got close enough for the guardian to touch, she reached out and did so. I explained that any time we pet a dog we are rewarding them for whatever the happen to be doing at the time. Essentially, the guardian was training Ruby to invade personal space and jump up on her. And because the guardian was doing this, Ruby was confused into thinking this was the proper way to play with and interact with other people too. This is why the jumping up, mouthing and invading the personal space of the grandchildren occurred when they visited. I suggested the guardian start to use my petting with a purpose method as well as passively train her dog by petting it while saying the command word for any action she did voluntarily that is also a command. When Ruby sits near the guardian, she should pet her while saying the word sit. Adding this small bit of structure can go a long way when it comes to dog obedience and behavior. Because arriving guests were one of the times Ruby got the most excited, I wanted to show the guardian how she can establish a boundary to the front door. By increasing the distance and training Ruby to stay behind the designated boundary on her own, we can reduce the intensity of the new guest’s arrival and help the dog practice some self control at the same time. After demonstrating the technique, I had the family member step outside and play the part of an arriving guest again so I could coach the guardian through the exercise herself. It only took a few minor corrections before Ruby was laying down on the top step, aka Penthouse, on her own. I recommended that the guardian ask her family and friends to drop by over the next week so she can practice this exercise. They should call or text a few minutes before their arrival so that the guardian can be prepared to react right away instead of being caught by surprise and rushing. Incorporate new rules and boundaries and consistently enforce them within 3 seconds. Introduce a dog bed and use treats as show to develop a positive association and command word with it. Start petting Ruby with a purpose. Use passive training to reinforce desired behaviors. Recreate any scenario or situation where Ruby displays unwanted behaviors. Practice each step individually until Ruby has it down before practicing the entire experience again. Use Escalating Consequences to disagree with Ruby, preferably before she breaks a rule. Get into a habit of defining personal space so that Ruby isn’t so in the face of the grandchildren and other visitors without an invitation. Put Ruby in a position to succeed by taking her for a long walk or game of fetch an hour or so before the grandchildren visit. Use the Martingale collar with the special twist of the leash to keep Ruby in the heel position on structured walks. Remember to use quick tugs to correct and immediately remove tension from the leash afterword. Practice the Focus exercise a few times a day in short one minute training sessions. Eventually start delaying the treat delivery for the second movement to hold Ruby’s attention focused on her guardian’s face. Practice leashing Ruby up for a walk a few times a day and abort the process any time she gets excited. Go to well of stairs and toss a treat to the top of the stairs and say “Penthouse” when she gets them. Practice the door answering exercise once a day (or more) for the next week to ten days until she waits behind the boundary on her own.